So, it's not a surprise to say that I could literally live in denim...No matter what season it is. Denim has definitely become a staple in which we should at least all own a piece of in our closets. With that said, when I came across this chic coordinating set I freaked! How cute is it? Since my mindset has already transitioned into spring, I loved the off the shoulder top and the asymmetrical bottom & frayed detailing. 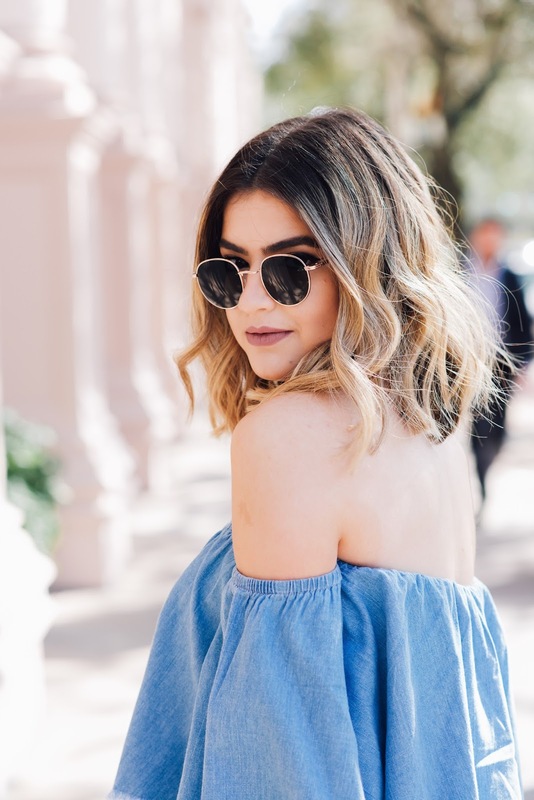 Off the shoulder tops will continue to be a big trend this upcoming season. I actually had a hard time figuring out what shoes I wanted to pair with this look. Since it's denim, there's so many ways you can take it in, like casual or a little more dressy. I was going to wear some tan knee high gladiator sandals, but when I styled it all together it just didn't say much to me! Then, I totally remembered I had recently received these denim heels from Shoe Dazzle, but I initially thought it was going to be too much denim. I quickly snapped out of that thought, like really? too much denim? No way! This was the first time I had really come across fully embellished denim heels that didn't look tacky, so ending result.....I loved how it all looked together! Sadly, I searched everywhere for this coordinating set to link above in the outfit details but it apparently sold out really quickly off the Agaci website. I went ahead and linked some of my other favorite denim looks I would totally rock and hopefully you'd like as well!